The Short Version: True to its name, Farm Sanctuary shelters farm animals in the peaceful pastures of New York and California. Since 1986, the nonprofit organization has saved countless sheep, cows, pigs, and other animals from factory farms and slaughterhouses. Farm Sanctuary also get calls from Good Samaritans, supporters, and local humane officers for a variety of situations, including cruelty and neglect. Co-Founder Gene Baur leads a dedicated community of animal rights activists and encourages everyone to live more compassionately by eating less meat. At Farm Sanctuary, vegans and their allies come together to help protect the lives of animals by promoting a vegan lifestyle. If you’re interested in combating animal cruelty — or if you just want to meet a bunch of kind and altruistic people — you can join the shelter’s fun events held throughout the year. Farm Sanctuary unites people with common ideals and motivates them to make the world a kinder place. Every year, Farm Sanctuary invites people to visit its grounds and see the rescued animals living there. It’s called a Hoe Down. 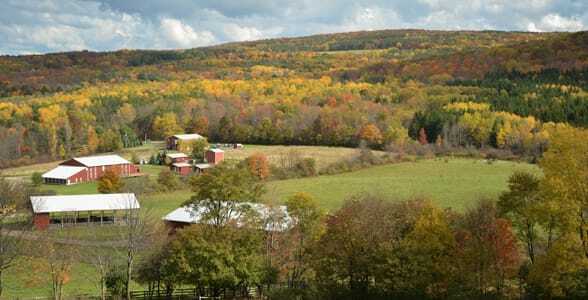 In tranquil pastures and amid rolling hills, animal lovers form a tight-knit community based on vegan values. As night falls, attendees chat under the stars before going to sleep in tents on the sanctuary’s campgrounds. 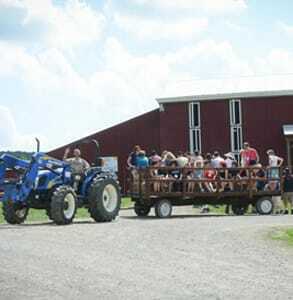 Hoe Down attendees can take a hayride to see Farm Sanctuary’s grassy grounds and content animals. Around 250 people come from across the country to enjoy the fellowship of the vegan-friendly weekend. It’s an inspirational and educational experience for many attendees who learn more about the living conditions of most farm animals and how everyday people can help by making mindful choices at the grocery store. In addition to educational presentations, the weekend is packed with fun activities, including hayrides, cocktail hours, discussion panels, and book signings. And, of course, there’s an evening hoe down. As the music thrums, people dance, cheer, and show support for a kinder way of life. The Hoe Down attracts a large crowd — tickets tend to sell out months in advance — and reinforces a community atmosphere among vegans. It’s a great place to take a date if you want to introduce them to vegan culture, and it’s also a terrific opportunity for singles looking to meet compassionate and friendly people. Since 1986, Farm Sanctuary has saved the lives of farm animals and raised awareness about the conditions fostered by factory farming. You can volunteer at Farm Sanctuary to take action alongside the hard-working and vegan-friendly team. Those who work at the sanctuary hope to change hearts and minds by offering compassionate alternatives to a meat-eating culture. Farm Sanctuary rescues hundreds of farm animals each year. Photo Credit: Farm Sanctuary. In 1986, Gene and his then-girlfriend were investigating the living conditions of animals in factory farms, stockyards, and slaughterhouses. What they found convinced them of a need for an animal sanctuary. It all started because of Hilda the sheep. 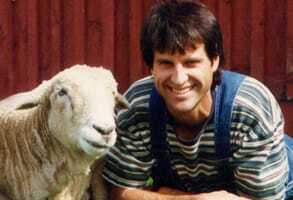 According to Gene, the idea for New York’s Farm Sanctuary began when he met Hilda the sheep. The couple was at Lancaster Stockyards looking at discarded dead animals when a sheep on the top of the pile lifted her head. The six-month-old lamb was weak and had been left there for dead. Gene immediately scooped her up and rushed her to the vet, in hopes of ending her suffering. However, after being properly cared for, she perked right up. She wasn’t sick at all. Hilda the sheep had been tossed aside because she was a downer, an animal who cannot stand; however, once removed from the cruel living conditions of the stockyard, she recovered and thrived. She lived another 11 years on the green pastures of New York’s Farm Sanctuary. Her story inspired many people to advocate for more humane animal treatment and condemn the unnecessary cruelties inflicted on farm animals. Today, the Friends of Hilda Club honors her memory with regular contributions to Farm Sanctuary, which rescues hundreds of sheep, pigs, cows, and other farm animals a year. The large-scale charitable operation relies heavily on community support. In the early days, Gene funded his fledgling organization by selling vegan hotdogs out of a van at Grateful Dead concerts. For the past 30 years, he has worked to make vegan values more palatable and accessible to the general populace. Farm Sanctuary serves as a positive and engaging resource for anyone curious about veganism or animal rights. Farm Sanctuary approaches animal cruelty as a people problem and works with people to correct it. The organization endeavors to reduce meat consumption by convincing one person at a time to take up a healthier plant-based diet. Gene remarked that when most people find out he’s vegan, the first reaction is something along the lines of, “I could never do that.” Farm Sanctuary aims to put an end to that defeatist thinking and show non-vegans how small shifts in their eating habits can make a significant difference. It could be as simple as participating in Meatless Monday or adopting a farm animal cared for by Farm Sanctuary. Gene believes in treating animals with compassion and respect as a matter of conscience. If you’re trying to persuade a loved one to go vegan, check out the website’s educational content — Farm Sanctuary offers vegan recipes and community stories to highlight the positive aspects of the cause. Plus, Gene literally wrote the book on living an animal-friendly lifestyle. “Living the Farm Sanctuary Life,” co-authored by Gene Baur and Gene Stone, gives readers practical tips for eating mindfully and living longer as a result. One of Farm Sanctuary’s most popular events is the summer Hoe Down, a weekend of camaraderie and campfires, but there are tons of chances throughout the year to get involved with the shelters and meet animal lovers of all backgrounds. Every November, Farm Sanctuary hosts a Celebration for Turkeys as a vegan alternative to Thanksgiving. During this all-day event, turkeys are the guests of honor, not the meal. The feast includes pumpkin pie, cranberries, squash, and other vegan fare. They feed the turkeys in a special ceremony and give thanks for all human and non-human friends in the world. From vegan-friendly picnics to star-studded galas, Farm Sanctuary rallies people under a common mission to protect animals and live more compassionately. You can read more about upcoming events here and plan a vegan-friendly date with someone special. When you connect over a common cause, it’s easy to build strong bonds with people. The more dedicated members frequently host small gatherings to discuss salient issues and build solidarity among animal activists. You’ll find many passionate and like-minded allies at these meetings. Helping the cause can be as easy as signing up as a volunteer or attending a vegan-friendly event near you. Farm Sanctuary also takes on interns who support the work of the farm day to day. Many young vegans come together at the shelters to make a difference and have a good time while they work. Whether you’re vegan or veg-curious, Farm Sanctuary is a safe haven where animal lovers work toward a kinder world. For over three decades, the organization has rescued, rehabilitated, and sheltered farm animals in New York and California. At vegan hoe downs and plant-powered marathons, Farm Sanctuary provides a friendly atmosphere where you can bond with people who share your compassion for all living creatures. Animal allies can attend events to learn how to end the cycle of cruelty in today’s food industry. 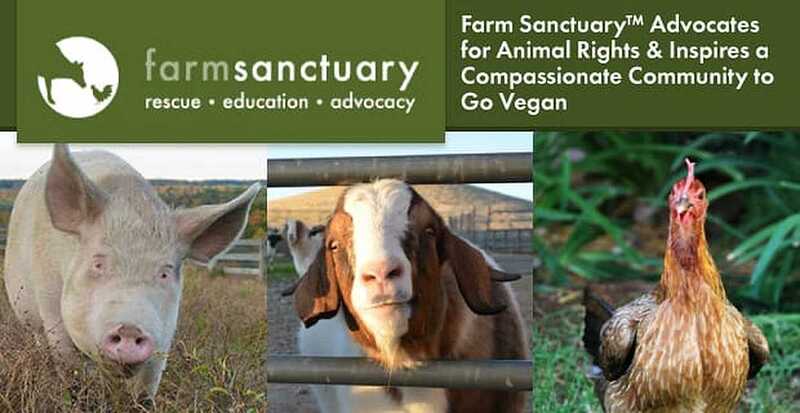 Farm Sanctuary promotes goodwill and understanding in an animal friendly community excited to spread the word about the health, social, and moral benefits of going vegan.